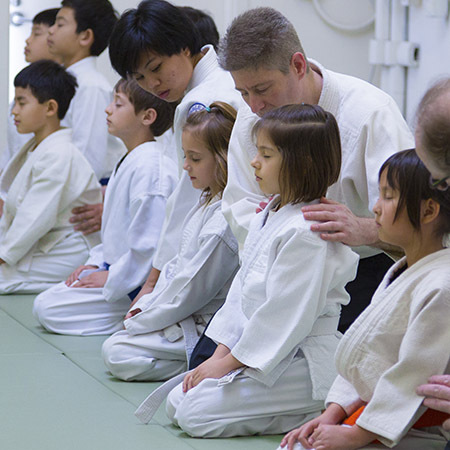 By cultivating good habits at an early age, Ki-Aikido and Ki Development give children a foundation they can rely on for a lifetime of positive growth. While childrens' bodies are growing, so are their minds. It is natural to develop the two together. In a physically active and cooperative learning environment, children learn the martial art Ki-Aikido. As they grow, they learn how to apply these lessons to all activities: school, play, sports, and relationships. At the heart of the Children's Program is the development of positive habits. Children are taught how to concentrate, how to relax without losing power, maintain good posture and to approach challenges with a positive outlook. During playful physical activity, they learn strength in Ki-Aikido is a matter of strength of mind, and application of Ki principles. Relative size and muscular strength become less important. Instructors demonstrate this, give children time to try themselves, and provide helpful correction. The Ki Society considers the Children's Program to be its foundation program. 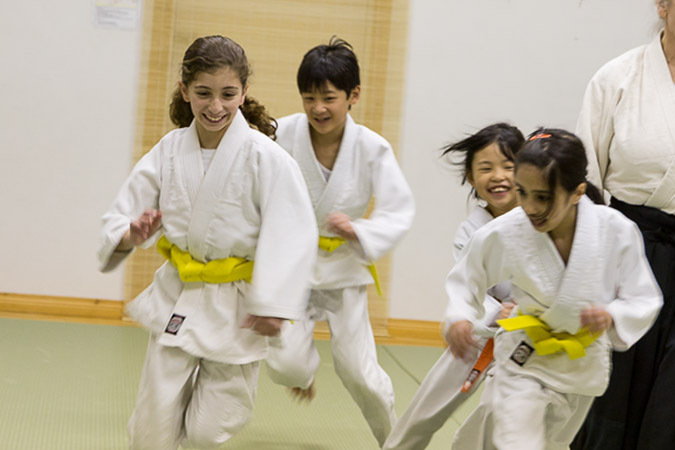 Through regular training at the dojo, children acquire positive habits they will retain into adulthood so they can make a positive contribution to their community. Classes are taught in a traditional dojo setting. Courtesy, respect and cooperation are fundamental lessons, and built into the formal beginning of each class. Children learn a variety of activities and skills, including stretching and playful warm-ups. 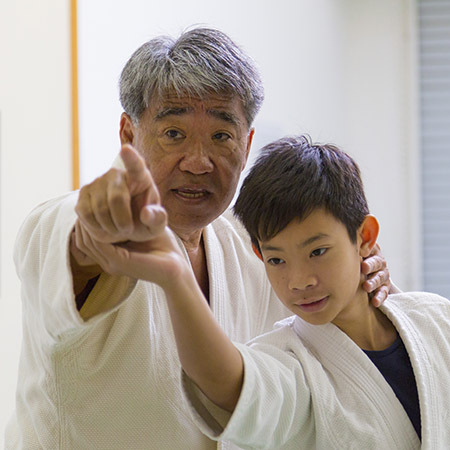 In addition to the instructor, adult assistants ensure that each child gets the attention he or she needs to learn the lesson and to train safely. In each class, time is devoted to learning Ki-Aikido arts. A Ki-Aikido art consists of one person attacking and another person performing the Ki-Aikido technique. Since the result of every Ki-Aikido art is for the attacker to fall to the ground, it is necessary to learn how to fall safely where led. These skills are taught at the pace children are able to learn them. Other students in the class train with respect of each other's abilities in this area. Lessons are often summarized at the end of class, showing students how the day's learning can be applied to their life outside the dojo. 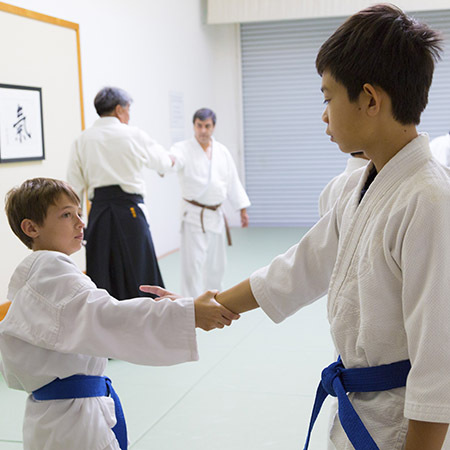 Your child may start his or her study of Ki-Aikido at any time. Please contact your local dojo ahead of time and let them know you wish to visit. Your child's first class will be treated as an introduction at no charge. Upon arrival, parents or guardians will be asked to fill out a registration form. Attire for the first class is a cotton T-shirt, and warm-up pants that cover the knees. Children who train regularly are encouraged to wear a special uniform called a gi. This uniform is available for purchase at your local dojo for a nominal price.